With an enormous 500 mile coastline it’s a given that some of Italy’s best stretches of sand are laid here. 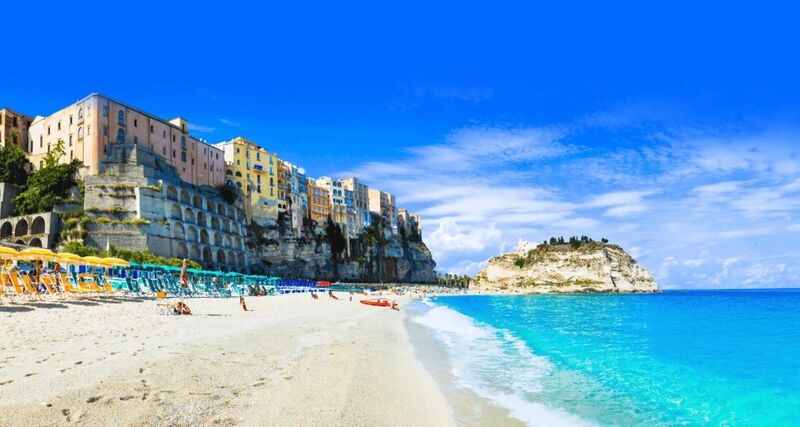 If you happened to see Gino D’Acampo and his Italian coastal escape on TV you’ll know exactly what we’re talking about. If not, then imagine white-sand beaches, fantastically clear water and smouldering volcano views. You’ll feel like you’re in the Caribbean, in just a quarter of the flight time. Foodies get excited, it’s no secret that Italy has many delicious dishes up its sleeve (or shall we say in its shoe!) but Calabria in particular has some very distinctive ones of its own. From the traditional spreadable sausage Nduja to the unexpectedly sweet flavour of Cipolla di – a bright purple onion you’ll find in your pasta, pizza and even as a gelato flavour. Plus, if you’re a Nando’s hot sauce lover, you’ll be in your element here as it’s the land of red gold, AKA red pepperoncino – a chilli pepper that makes up some of the spiciest cuisine in Italy. If you’re normally always on the go, this place will be a shock to the system – in a good way. You’ll already know Southern Italy has a reputation for moving super slow and siesta-loving Calabria is a prime example. From 1–4pm each day, expect ghost town feels while everyone takes a little afternoon snooze. With everything closed during this time, it’s the perfect excuse to do the same without feeling the slightest bit guilty about it. Breath-taking views are the norm here, thanks to the cliff-top towns, unspoilt beaches and landscape shaped by olive groves and vineyards. You’ll get to see Italy in a different light because mass tourists just don’t seem to be a thing. You’ll also capture pictures of the Calabrian charm without other tourists photo-bombing your view. Back to our favourite topic, food. Along Calabria’s gelateria-lined streets you’ll experience some of the best ice-cream you’ll ever find, especially in Tropea’s historic emporium Gelati Tonino. Here there’s every flavour imaginable, yep its true – onion gelato really is a thing. The showstopper though is Tartufo – a cocoa-dusted ice cream ball of chocolate-fudge, nutty goodness. Will you be taking a visit to Italy’s new kid on the block? Book early and be first in the queue for summer 2019, or even reserve your spot for summer 2020. Have a browse of our latest Calabria holiday deals. Read previous Where is hot in January?